This chapter argues that game-changing green-growth must be rooted on economic approaches allowing for the inherent complexity of human-environment relationships, implemented through multi-stakeholders and multi-scale governance arrangements and fuelled by policies and managerial techniques promoting synergies – rather than just decoupling – between environment and growth. The evolution of conceptualizations between growth and environment is first discussed in this chapter. The debate evolves from zero-growth versus uncontrolled growth, to sustainability and parallel discourses emphasizing such principles as ecological modernization and the win-win paradigm. 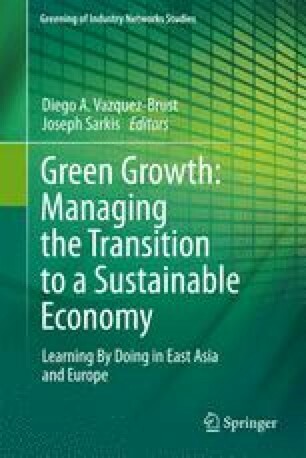 The chapter then describes the emerging discourse of Green Growth and positions this discourse in the context of its predecessors. Transition challenges (e.g. how can we define and measure green growth) and an overview of diverse methods to meet environmental challenges, such as cradle-to-cradle will also be summarized. A framework conceptualizing the main dimensions of Green Growth and mapping the chapters to this framework is then introduced.